President Trump on Friday signed a reform of civil service laws at the Veterans Affairs Department, saying he was “very proud” to be enacting the bill to ease the firing of employees. 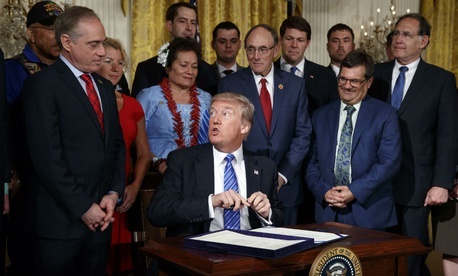 Trump highlighted what he called the “transformative change” his administration has already implemented and said the VA Accountability and Whistleblower Protection Act was just the beginning of forthcoming reforms at the department. The law will give VA Secretary David Shulkin the authority to fire any employee, lower the threshold to prove the action was justified and expedite the appeal process. Trump said it would help VA remove employees involved in recent scandals involving waitlists and patient data manipulation. The bill would allow the department’s secretary to fire, suspend or demote an employee with only 15 days' notice. Employees would be able to appeal to the Merit Systems Protection Board in an expedited timeframe. MSPB would have 180 days to issue a decision, with the law designed to make it easier for VA to prove a negative personnel action was warranted. Employees would maintain the right to appeal an MSPB decision to federal court. Unionized and Senior Executive Service employees would each have distinct, internal grievance processes that would have to be completed within 21 days. VA could revoke bonuses from employees found to have engaged in misconduct or poor performance prior to the award and dock retirement benefits from workers found guilty of a felony that could have affected their work. The bill had widespread support from veterans groups and members of both parties. Employee groups, however, have warned the measure will lead to politicized punitive actions and labeled it an existential threat to the non-partisan civil service. Trump made clear he did not view the bill as an attack on VA’s workforce. Shulkin, who also spoke at the ceremony, said the law would actually provide a boost to his workforce, suggesting that “nothing is more demoralizing” than employees who perform poorly or engage in misconduct coming back to work. The bill follows several attempts in the last Congress to streamline discipline at VA. A 2014 law reformed the process just for senior executives, but a federal court has ruled the provision unconstitutional and the department is no longer using the new authority it provided. Rep. Phil Roe, R-Tenn., the House Veterans' Affairs Committee chairman, said after the bill passed last week it could serve as a blueprint for similar reforms across government, adding he expects his colleagues in the House Oversight and Government Reform Committee to look at the VA bill before possibly drafting broader legislation.